From amongst the shadows, take a glimpse this May of Fairfax House coming to life and to light after dark. As part of the national MUSEUMS AT NIGHT programme Fairfax House opening its doors at night for a highly illuminating candlelit performance by the mansion’s ‘original Georgian inhabitants’. Lord Fairfax, his daughter Anne, and their retinue of servants make a return to the 21st century to give their unvarnished views of life after dark in their Georgian townhouse. Electric lighting will be strictly taboo. Guests will be taken through the House by Lord Fairfax and members of his household staff by candlelight. 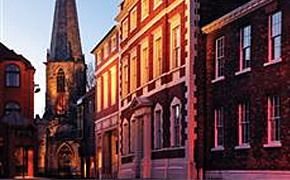 With more than a dash of daring and danger, this performance not only explores what life was like after dark but reveals some of the dangers of living in Georgian York after the sun has set. Fairfax House After Dark is now into its sixth season, and has delighted audiences with its combination of fact and fiction wound around the original occupants of this Castlegate residence. Performance intersects with historical detail to give a humorous twist on Georgian life, as well as unequalled access to Fairfax House in its ‘after dark’ cloak. With audience sizes strictly limited to 20, it is a first come first serve opportunity, and tickets should not be missed. Two performances of Fairfax House After Dark will be run during the Museums at Night Festival for two nights only on Friday 15 and Saturday 16 May. Starting at 7.30pm places are strictly limited. Tickets cost £14.00 and can be booked through the Fairfax House shop on 01904 655543.